Ride the OPR on Saturdays! Ride the Oregon Pacific Railroad passenger train from the Oregon Rail Heritage Center and back via the Oaks Bottom Wildlife Refuge along the Willamette River Saturdays! Trains depart the ORHC at 12:30pm, 1:30pm, 2:30pm, 3:30pm and 4:30pm for an approximately 45 minute long round trip. See www.portlandtrainrides.com for more information. At its March 2019 meeting, the National Railway Historical Society awarded two grants to projects at the Oregon Rail Heritage Center on SE Water Avenue in Portland. The Oregon Rail Heritage Foundation (ORHF) received an $8,000 award towards the refurbishment and installation of a 102’ continuous turntable, the last remaining historic element of the former Southern Pacific Brooklyn roundhouse. It will be one of only a handful of powered operating turntables accessible to the public in the West. The Turntable Project will complete design review by summer. The NRHS grant for the turntable will be matched by a $4,000 donation from the Murdock Trust. In December 2018, the Murdock Trust provided a cash award of $250,000, and has also pledged to match one dollar for every two additional dollars raised for the Turntable project through the end of this year. The Pacific Railroad Preservation Society (PRPA) also received $8,000 for work on the former Seattle, Portland & Spokane steam locomotive #700, originally built by Baldwin Locomotive Works in 1938, and the last surviving steam locomotive of its type. 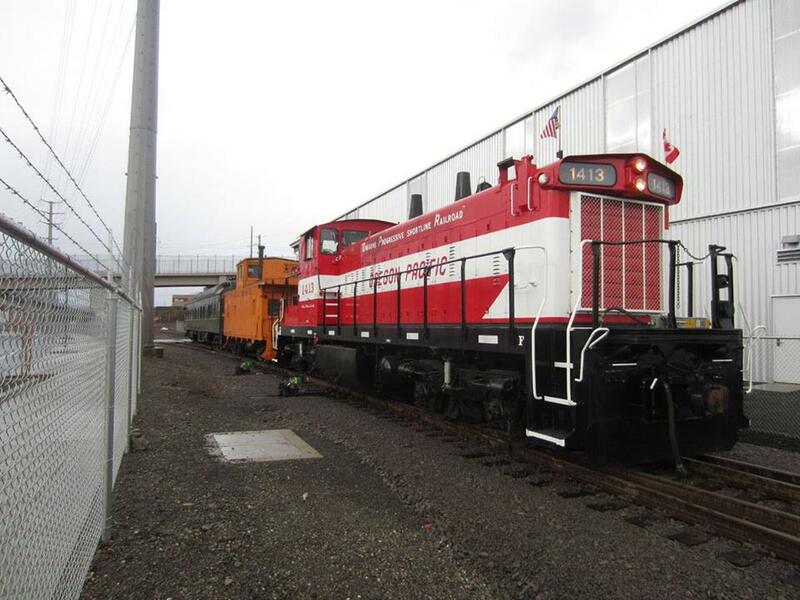 The SP&S #700 was donated to the City of Portland in 1958 and resides at the Rail Heritage Center. PRPA is one of the founding partners of the Oregon Rail Heritage Foundation. The NRHS grant is specifically for the rebuild of two air pumps used in the locomotive braking system. The SP&S #700 is expected to be back in active service in early 2020. “We are proud to be partnering with the NRHS in preserving these historic treasures,” said Roy Hemmingway, ORHF President. The Oregon Rail Heritage Foundation’s mission is to provide for the preservation, operation and public enjoyment of Portland’s historic locomotives, railroad equipment, and artifacts, and to educate the public about Oregon’s rich and diverse railroad history. The Foundation operates the Rail Heritage Center, a working museum housing the City of Portland’s three steam locomotives and a variety of vintage railcars in Southeast Portland near OMSI. This is the first of an occasional series on where to go for train watching in the greater Portland Metropolitan Area. Wilsonville is a community about fifteen miles southwest of Portland. It is the south end of TriMet’s rail WES (Westside Express Service) route, and on the Portland and Western rail line between Albany and points south leading to multiple destinations in the Portland area. Why this spot makes the list, let alone the leadoff post, is unique. It’s because there’s a train you can count on. The West is big, and terrain and weather gang up on BNSF and the Union Pacific to scramble the schedules. For train watchers this means bring a book. The trains will come — sooner or later. Except at Wilsonville. With WES using the tracks during the morning commute between Wilsonville and Beaverton with stops along the way, the freight service waits. When the last WES train clears the tracks, the freight moves north. That would be 10 am. Here’s my phone video. My very fine, legal, comfortable, and great view place for train watching in Wilsonville is south of Wilsonville Rd off Boones Ferry Road. If you’re coming from the north, exit I-5 at Wilsonville Rd. Take the first left at the signal and stay in the curb lane. At Fifth St. turn right and park. If you’d like a more rustic and sylvan scene stop further south at the park. The tracks will be up the hill with a shot through scattered trees. For more effort and creativity, the Willamette River bridge is there but the good shot is more challenging and potentially dangerous. Use common sense. My trips for train watching have been rewarded with long P & W manifest freights hauling everything from wood products (standing trackside you can smell the fresh lumber) to tank cars for distribution to Class I railroad terminals for trans-shipment. The freight rides behind four diesel units working hard as they climb the short grade before the long run north continues. Amenities near-at-hand abound. There’s a Starbucks two blocks away. Not a fan? There’s a Peets in the Fred Meyer across the street. Hungry? Eat at McMenamins across the parking lot from Fred Meyer. Breakfast-kind of hungry? There’s a Biscuits Café just north of McMenamins. While you’re warm sipping coffee and licking frosting off your fingers, hold the thought. There are few spots as welcoming as this for train viewing in the Portland area. Essex, Montana. A flag stop on the Empire Builder’s trips back and forth on the northern transcon. 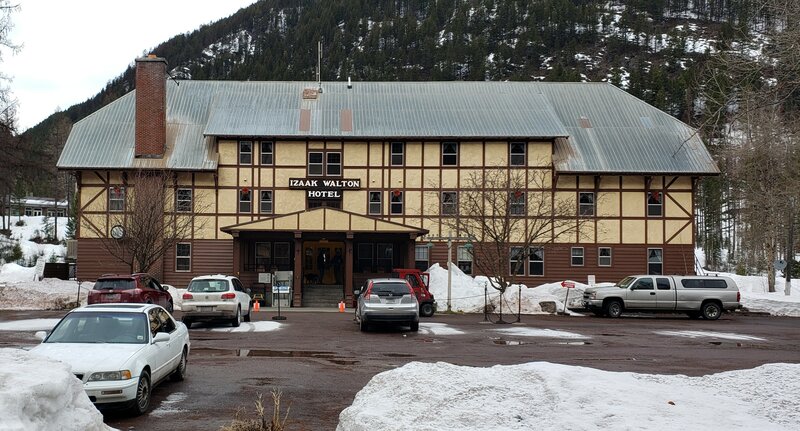 Located fifty miles south of the Canadian border, and eight miles west of the Continental Divide at the Marais Pass, Essex is home to the Izaak Walton Inn. The inn is the epitome of what a great railroad inn should be. Westbound on the main with the inn’s cabooses on the hill. The Great Northern Railroad built the inn in 1939 for its crews working the top of the grade. Years later, when the railroad sold the inn to private owners, the emphasis shifted to travelers aimed at Glacier National Park. 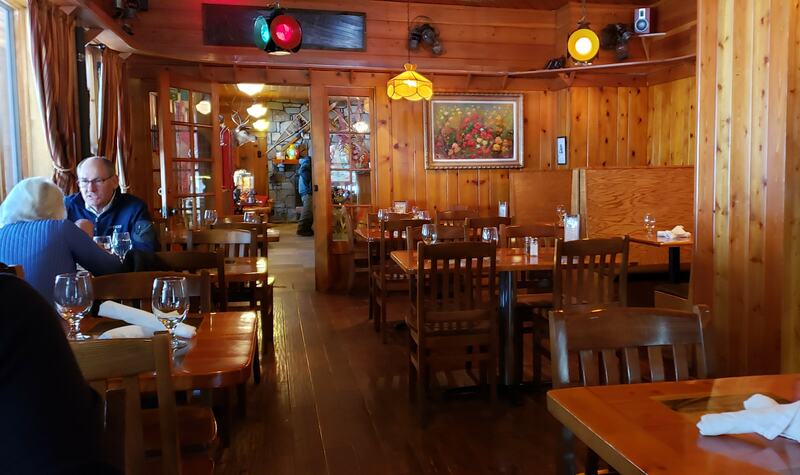 Today the inn is a destination for train enthusiasts and outdoor lovers looking for winter cross country skiing and snow shoeing, as well as warm weather sports like trout fishing in the Flathead river, and the chance to see the wonders of Glacier. 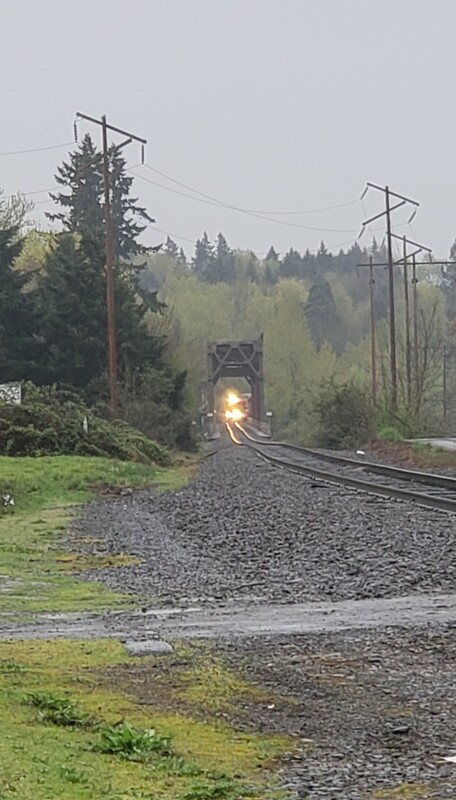 When I visited the last week in March of 2019, highs in the low forties made it possible to sit in the swings on the covered porch to wait and watch for the BNSF unit trains and manifest freights thundering east and west a mere eighty yards away. When it got too cold, moving inside next to the fire to watch those same trains through windows stretched the fun into a daylong joy. 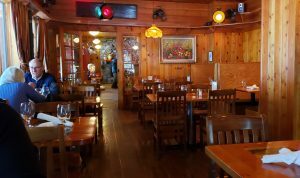 The restaurant is open from 7:00 am to 10:00 pm. Less formal meals are available in the full service bar starting at 11:00 am. It’s a good thing the food is good because unless you brought your own, the inn is it. The inn’s dining room complete with Lionel track above the windows and doors. a travel steal. My trackside room in winter and midweek at the inn was $159/night plus tax. You will find no shortage of people to visit with from all over, but if you don’t like crowds go before the end of May or after Labor Day. For more details visit the inn on the web at izaakwaltoninn.com. The Oregon Rail Heritage Center introduces “ORHFlix,” volunteer-produced short videos of the rail experience found at the Center on SE Water Avenue in Portland, Oregon. The ORHFlix are found on You Tube. Currently there are four ORHFlix videos posted. They are What Makes A Steam Train Go, Holiday Express 2018, Welcome to the Center, and a short intro to the upcoming turntable installation. volunteers with our trains and our guests. If you like what you see, please click the like button. When you visit our You Tube videos please subscribe to receive notices of future posts and links to see them. from complications of life-long diabetes. She was 68.
tomatoes were in pots close to the kitchen door. exposed on top as garnish. Also many costumed annual Red Dress fundraisers. colorful legacy within us always. Colorado and Bill Hattendorf of Michigan. Lyon may be made at http://www.orhf.org then click on the “Donate” button.